New research from the University of Warwick shows that using the Royal Shakespeare Company’s (RSC) approach to studying Shakespeare can significantly improve student language acquisition and skills – with some schools reporting better SATS and GCSE English scores as a result. The research, carried out on behalf of the RSC by the Centre for Educational Development, Appraisal and Research (CEDAR) at the University of Warwick, included 100 schools nationwide who are involved in the RSC’s Associate Schools’ Programme. The study focussed on evaluating the impact of the RSC’s approach to teaching Shakespeare, which uses the same techniques used by actors in rehearsals, and its impact on the language development of children and young people. Work with schools using RSC techniques in the classroom has been rigorously tested over 10 years. 95% of teachers said that using RSC methods to study Shakespeare resulted in their students becoming more willing to contribute ideas and opinions in class. 94% also said that the work was a catalyst to helping young people ‘find their voice’ – improving pupils’ language skills and their confidence with language, as well as giving them valuable experience of speaking out loud in front of peers and classmates. 95% of teachers reported an increase in confidence and understanding of what they are capable of as students get to grips with and ‘crack’ Shakespeare. This way of working was of particular benefit for boys previously considered to be ‘disengaged’ or low-level learners. Senior school teachers agreed that the RSC approaches were especially helpful in preparing students for the new GCSE exam which requires them to critically analyse previously unseen sections of text. One primary school Headteacher echoed the widespread belief that since working with the RSC, KS2 SATS results in English Grammar, Punctuation and Spelling (EGPS) had risen from 41.7% to 96.7%. In addition, 56.7% of those students had achieved higher levels than expected. 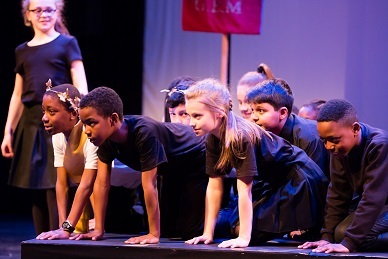 Teachers also agreed that alongside the RSC’s methodology, the long-term partnership model of working with regional theatres and schools was critical to the programme's success. This way of working is at the heart of the RSC Associate Schools’ Programme. ‘For the first time the research results provide us with evidence that supports what we’ve always known: that the combination of Shakespeare’s complex language and a theatre-based approach to teaching gives children of all abilities the language and confidence to express themselves and their ideas more easily. "The results also reinforce the importance of taking a long-term partnership-led approach - building local networks of talent and expertise with theatres and schools across the country. This enables us to deliver this work together and reach many more young people than would be possible for any of us on our own. Photo by Rob Freeman for RSC. The research and the impact of the RSC’s approach to teaching Shakespeare will be the focus of a symposium for Headteachers on Friday 22 June 2018 at The Royal Shakespeare Theatre in Stratford-upon-Avon. Raising Achievement and Aspirations Through Shakespeare: A symposium for Headteachers and their curriculum leaders, will include presentations from Headteachers who have experienced the impact of the work first-hand; keynote speeches from leading educators including Geoff Barton, General Secretary, the Association of School & College Leaders (ASCL); as well as the chance to hear more about the research and attend a series of practical workshops. For further information visit www.rsc.org.uk/education.